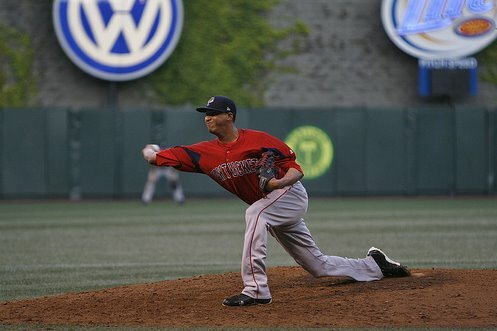 The Reason I dropped down was because I had a bad season as a started in 06 with the Portland Seadogs and when Spring Training came around the organization decided a changed was needed and of course I went along with it. Some of the advantages was the fastball movement. My ground ball % sky rocket. The struggle was against lefties which it was a huge adjustment that took over a year. The change up was the most difficult pitch throw but when it started to come around I was able to get lefties out at a higher rate. I think I still had the stuff to compete in AA and AAA over the top but If I would of rejected the offer on dropping down I would of gotten released since I was drafted on the 35th round. The pitching coach in AA always said act like your getting a tennis ball just below the waist and same rule applies on staying close and taking your front side to the target. I threw a sinker, slider, and change up from down there. On righties I used to start my sinker right down the middle and let it work down and in and then used my slider if I really needed a K or to change it up. I threw my FastBall about 85% of the time to righties and lefties. My off speed was just to mixed up but I lived with my sinker. I guess I really enjoyed pitching from down there in winter ball cause they use me as a specialist on righties. Is a working progress and I worked hard everyday by myself doing towel drills, shadow work, working on grips on the change up. I felt like in 09 I really got it going in Tripe A but I never got the called up or another chance after that. I had a job in 2010 but it was for independent ball and I just felt at that time in my life I had to go a different way in my life and decided to call it quits.